The great wine of Kakheti, Georgia! The Georgians will tell you; they were the first to make wine. 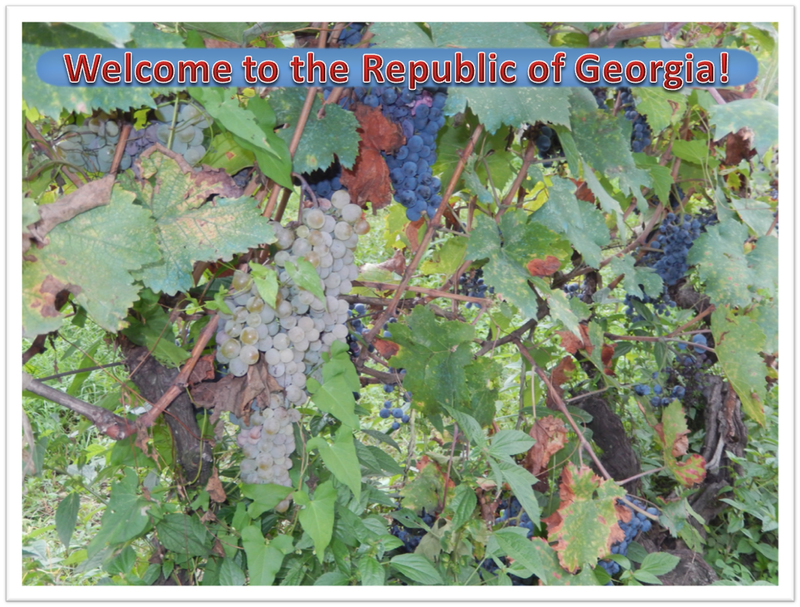 It is true that wine, grapes and all paraphernalia related to wine-making are omnipresent in the Republic of Georgia. The evidence is everywhere. Ancient markings on churches and monuments, on tombstones, wrought-iron decors of all kinds, horns in which to savor your favorite, grapes growing on every balcony, some with incredible grape stock so large you wonder how old it can be, grapes on every market stall, it is for sure that you cannot disassociate wine and the Georgians. However, present him with his favorite and national dish, a steaming dish of khinkali, and he will instantly grab a beer... It does go better with ludi, I agree..
On the planet of wine below, you see Koda's rkatsiteli grapes having been through the wringer. How will this wine be in a year? Only time will tell.. Harvest is upon the Georgians once more. Will this particularly dry summer bring a superb wine? No doubt! Families who share rows of grapes in the countryside are getting organized to gather together and cut the grapes. Soon, Tbilisoba will happen and churchkhela will be made, dipping strings of walnuts hazelnuts and other goodies in tatara, a mixture of grape juice, flour and sugar. Msvadi, bbqs will be roasted on the coals and accompanied by a great deal of wine. All will be processed, and in the end, you will drink a super Saperavi(red) or a Rkatsiteli(white), or make a toast with a shot of Chacha. 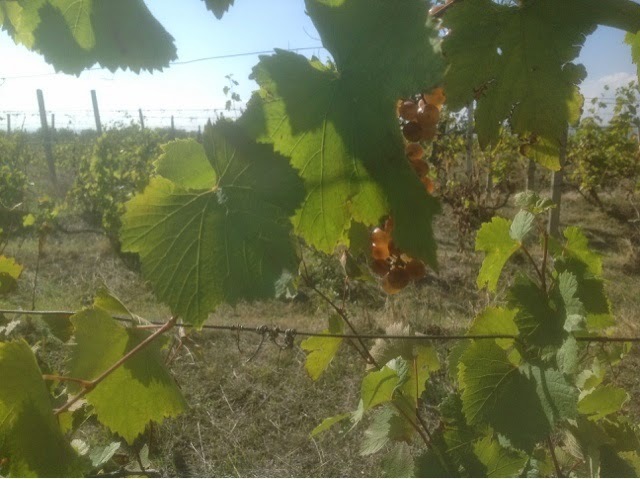 Then, the long winter will start..the qvevri will be full of the golden or red liquid resting until it comes to maturity. Grapes will be put through the wringer in this! All over Georgia, the harvest is being organized. Soon we go to the region of Kakheti and experience the flavors, the sights and the delicious result! In Koda, the ancestral village of the B.family, a plot is tended by the members, and grapes are collected for the year's supply of wine. 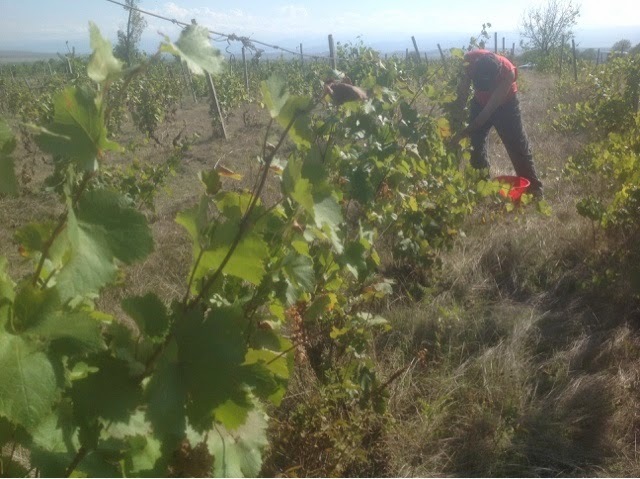 This was an extremely dry year, and only about 100 kilos of grapes came out of the 6 family rows. The grapes are never watered, and this year, they suffered from the extremely dry weather. More grapes will be purchased to add to this year's poor harvest, in order to have enough homemade wine for the coming year. 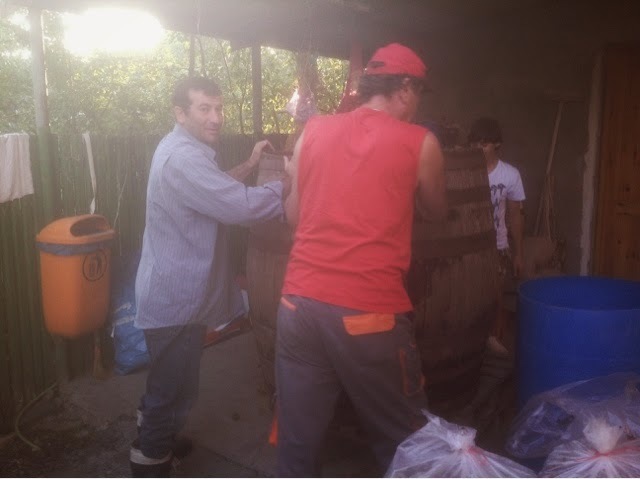 The grapes are put through a wringer to crush them, put into a barrel for a week, then the liquid is drained, and put into large bottles. The skins are left in the barrel and sugar is added. After a few days, when it ferments and bubbles, the pulp is used to make the powerful chacha, white if plainly distilled, or a golden brown when kept in an oak barrel after distillation. It is then called cognaki, or Cognac, and resembles the French Cognac . The grape juice in the large bottles is emptied and filtered several times, to remove the pulp that would make the wine less pure. It is then allowed to rest. The rkatsiteli grapes give a golden hue to the wine. No sulfates are added, it is pure wine. .
That is one traditional method. But of course, the method of keeping the wine in a qvevri differs a bit. Let's go to Kakheti and see how it's done! In Katheti, as well as in all other places in Georgia, wine is being processed in q'vevris, and in barrels. The traditional way of keeping wine in q'vevris is getting a boost these days, as it it particularly prized by tourists, and so contributes not only to the pleasure of the visitors, and to the national heritage, but also the economy in general. and a beautiful Georgian to boot! 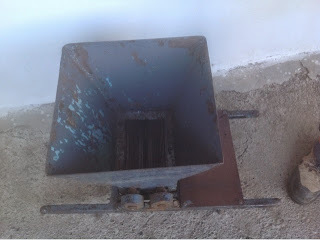 A marani is a set of q'vevris that are literally buried in a trench, then held straight and then covered with soil. 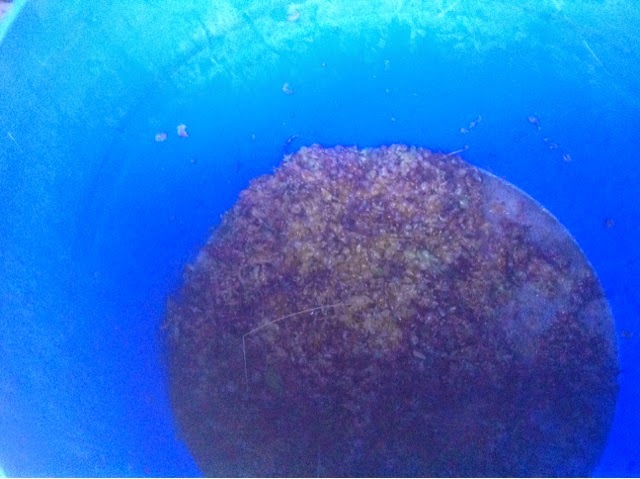 the distilled "chacha" has been made. 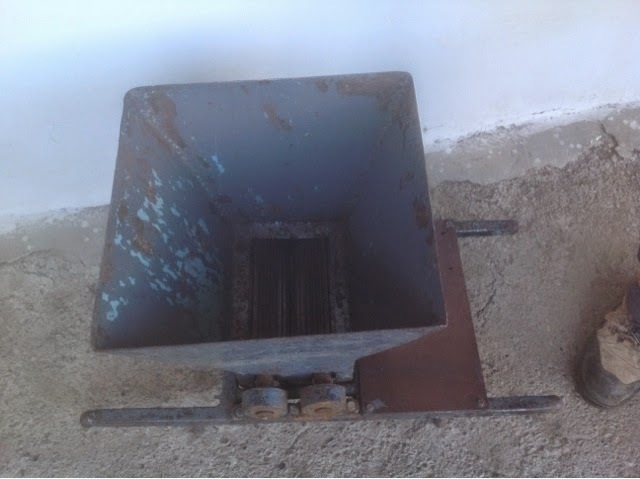 The marani looks like a cellar, where the wine caskets are below your feet! It is quite impressive to see how the caskets are filled to the rim with the wine! Others wait to become chacha and the smells of the grapes skins in fermentation fill the room. In Napareuli, in Kakheti, the Twins Cellar, a rather small organization compared to huge competitors in the region, turns out 280 000 liters of wine per year. The Khareba Winery, a local winery also referred to as Gvirabi, because it stands for "tunnel", holds an immense reserve of wines, mainly kept in barrels and other massive vessels from the soviet age. A little dark to take good pics in there, but a great place for tourists! In this picture, you see one of those great big vessels. The wine is actually carried in the pipes that you see going down the tunnel. It is impressive. The only drawback is that the wine tasting here is made of ...European wines!! Remnant of the Soviet era. In the gvirabi, you will see a variety of ancient and modern tools used in wine making, as well as some of their wines. It is definitely a must-see! This is not the q'vevri method, however! Napareuli's winery is interesting in the way that it is set-up. I do not recommend staying there, simply because the food and lodging were average in quality and above average in price, and the mosquitoes brought on in the chacha making season were awful. The rooms are situated right above the marani, and they smelled of alcohol. Touring the museum can be of interest. Disregard the poor English translations, for the information is actually quite good. Don't leave home without it! !